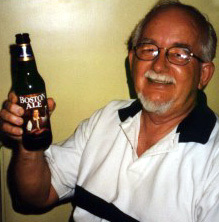 In September 1999, Jim and Cynthia came up from Texas. 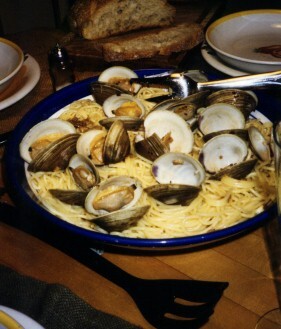 Fellow Rhode Islander Cynthia loves quahogs so Bruce and I cooked up the best Spaghetti alle Vongole made with fresh Rhode Island Little Necks. Add the olive oil to a hot pan and heat, then add the garlic and cook briefly until softening but not browned. Add red peppers and cook very briefly. Then add white wine and simmer to reduce while the pasta cooks. 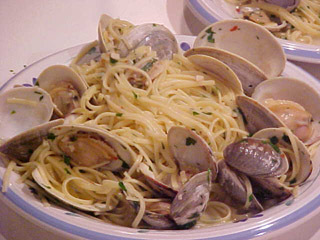 Add quahogs and reheat, but do not allow to boil or clams will be tough. Drain pasta and put in a wide serving dish. Add clam sauce and the parsley. Mix lightly. Season with black pepper and serve immediately. Parmesan cheese is generally not served with this dish. 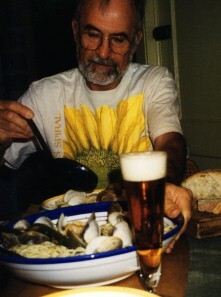 While waiting for the Spaghetti alle Vongole, Jim enjoyed Boston's own Sam Adams. 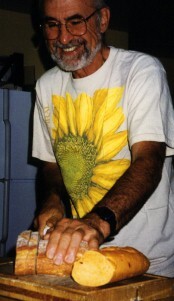 Bruce cut the bread, and served up the spagehetti. 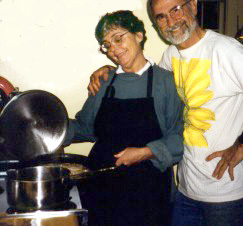 We did quite a bit of fun cooking in '99, including a share of lobsters and crab meat. Ate our fill of barbecue too. Quahogs and mussels are among our favorite dishes.